As we strive to be better communicators and storytellers, it often helps to get out of our comfort zones and read inspirational literature that can teach us new things. We often find those types of books in classical literature, or from the latest fiction and non-fiction books. Sometimes, “How-to” guides also help. That happened to me recently when I picked up the book, “A Mind for Numbers: How to Excel at Math and Science (Even if You Flunked Algebra).” You may be asking yourself, “Why would a PR guy be reading a book about math and science?” Isn’t the reason you pursued journalism and then PR in the first place is that you stunk in those other areas? Well, as it turns out, author Barbara Oakley, Ph.D., did, too. But through a gradual retraining of her brain, she earned a Ph.D. in systems engineering after completing bachelor’s and master’s degrees in Electrical Engineering, and Electrical and Computer Engineering, respectively. She now teaches engineering at Oakland University in Detroit, and is a leading educator in the area of STEM education. While her book is primarily geared toward helping high school and college students successfully navigate the aforementioned disciplines, it’s ultimately a guide to improving skills and techniques for learning how to learn. And that can be useful for people in any profession, including PR. For instance, Oakley describes the two modes of thinking: the focused and diffuse. The focused mode is like the flashlight setting that casts a bright light in a narrow area. It’s a direct approach to solving problems that requires rational, analytic and sequential ways of thinking. When we’re working intently on a project, like writing a white paper or drafting a PR plan/strategy, we use the focused mode of thinking. But the diffuse mode also plays an important role in those projects. It taps other parts of the brain and is akin to turning your flashlight setting to casting a wider yet less powerful light. As its name suggests, the diffuse mode is wider and big picture. It’s a resting state in our brains. It works quietly in the background and allows us to form new insights. It kicks in when our minds wander, or when we take a break from a focused task to walk, jog, listen to music, sleep or play video games. Oakley’s point, backed by the hundreds of research studies that inform her book, is that we must maximize both types of thinking to learn and tackle problems. If we’re working on a specific assignment, it’s important to step away from that work at intervals to allow the diffuse mode to enter the picture. By pursuing a leisure activity or working on some other job assignment, we allow our diffuse mode of thinking to continue working on the first task at hand and lend new insights. The diffuse mode opens up possibilities that we may not have considered in the focused mode and prevents us from believing that only one approach to a project is the single way of accomplishing it. Avoid procrastination because it prevents the diffuse mode from helping a project or media campaign. While the luxury of time is not always possible in our profession, especially in crisis communication situations, building a timetable of assignments and deadlines, with thoughtful consideration, can help improve the overall response and results. Don’t cram to memorize a speech or the big PR plan presentation in one day. Rehearse and study over a series of days and/or weeks. Research shows that we retain the material better, avoid reading the screen verbatim, and make more genuine presentations. Avoid reading literature or meeting notes over and over again to learn the material. Instead, use a technique called “pause and recall,” i.e., turn away from the literature and notes after each page or several pages, and describe the concept in one’s own words; that’s the way we build chunks that form strong neural connections in long-term memory. “Lady Luck favors those who try.” Sometimes, we feel downtrodden if a media pitch fails to elicit that desired interview, for example. Perhaps it’s time to let the diffuse mode help; alternatively, we could pick up the phone, be persistent (within reason), and converse with that target reporter directly. In my experience, with professionalism and respect for the journalist on the other end, the odds are good. Having worked across a number of industries during my career, I feel pretty safe in saying no industry loves it jargon (and acronyms) like healthcare. The general technology industry probably comes in a close second, but for pure technical mumbo-jumbo you can’t beat healthcare. Part of it, I think, is that the healthcare industry is filled with a lot of smart people. Because of that, everyone feels like they have to sound like the infamous “smartest person in the room.” So they load up their content or their speeches or even their everyday conversations with a lot of jargon designed to give that impression. Yes, you’re open and interoperable. Yes you follow evidence-based best practices. Yes, your methodology is transformative and sustainable. Yes, your subject matter experts have a wealth of experience in solving the toughest problems facing the industry. But again, what do you do? If I, who has an employment-based incentive for comprehending your inscrutable jargon can’t figure out what you’re trying to say, what do you think happens to the typical prospect doing a fly-by? They see a bunch of words and terms they’ve heard 100 times before. They try to determine if they’re in the right place, looking at the right company. But if it doesn’t come to them immediately, odds are they just move on. You lose. You’ve probably heard this quote, often erroneously attributed to Albert Einstein: If you can’t explain it simply, you don’t understand it well enough. Ol’ Al may not have said it, but there is a lot of truth to it nonetheless. I know this from personal experience. Thanks to my work here at Amendola Communications, I have had the opportunity to speak with some incredibly smart, accomplished people. They are the kind of people who are leading all of healthcare toward amazing new discoveries and ways of working. While they come from different backgrounds and have expertise in very different areas, the one trait they all had in common was their ability to get their point across in a way that the average person could understand. Some were talking about advanced analytics and machine learning. Some were talking about the nuances of health insurance. Some were literally talking about curing cancer. But you never walked away from the conversation wonder what the H-E-double hockey sticks they were talking about. Instead, you walked away energized and inspired. Not to mention excited about the possibilities for the future and how their companies were creating them. Becoming a clear communicator like that isn’t easy. It actually takes a lot of work to make your communication sound effortless yet on-target. The first step, quite honestly, is not being afraid that people won’t think you’re smart if you don’t pack your content or your spoken words with industry jargon. In business there are no points awarded simply because you sound “smarter” than everyone else. The money goes to the people who show they understand the problem and how to solve it. 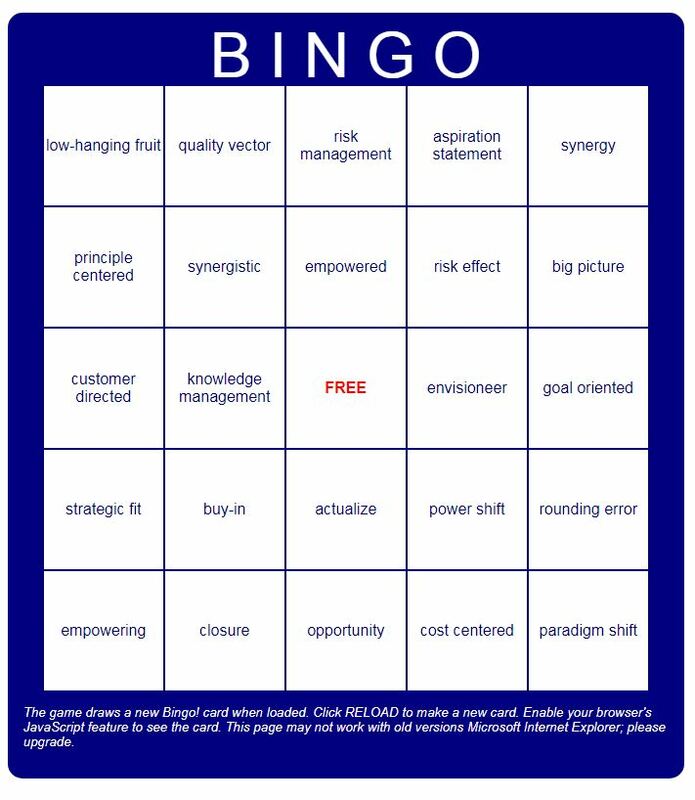 Once you’ve bought into that philosophy, start looking through your current content, perhaps with a Business Buzzwords Bingo card in hand. If you find you are winning within the first three paragraphs of a piece of content, especially your company website, you know you have some work to do. Now listen to speeches from great communicators or read materials from a technically sophisticated consumer product. Whether you were a fan of Ronald Reagan’s or not, the man knew how to sell an entire nation on a concept. Is what you’re doing any different? Or as my colleague Michelle Noteboom points out, see how Donald Trump approaches the same challenge. You may not like what he says, but you must admit he has a way of stating his positions simply. Car companies, especially the high-end ones, offer a great example of plain speaking. Even when they’re talking technical specs, they do it in a way that focuses on why you should care. Apple has always had a good handle on that as well. While everyone else in the industry was talking about jitter rates and Hz-related info, they were telling how you could get 1,000 songs in your pocket. Everyone can understand that. There’s the key. It’s not about the bells and whistles in your product. No one cares how much effort you had to go through to develop it. That’s your problem. What they want to know is what’s in it for them. The easier you make it to understand that, the more intrigued they will be. Well, very little anyway. It is healthcare, after all, and there are technical terms that must be used at times. But if you try to ensure that any jargon you use is essential to explaining your position, and that there’s no other way to say it, you’ll likely find prospects staying longer and going deeper on your website. And more willing to engage with you – all the way to a sale. Most of us are our own worst critics. It’s easy to understand why. After all, no one knows us better than us. Who better to uncover and critique all our foibles, follies and failures than our own inner critic? There’s a fine line, of course, between self-criticism and self-awareness. Maturity requires that we view ourselves with objectivity and correct those faults that can be corrected. The kind of criticism that comes of self-awareness and that leads to self-improvement is a prerequisite for happiness and love. But when it comes to work, self-criticism can be crippling. Carl Richards, a certified financial planner, author, and regular New York Times contributor, makes that point in his fine article for the Times, “Free Yourself of Your Harshest Critic, and Plow Ahead.” Richards argues that we accomplish much of our best work when we stop critiquing and just do it. Like Richards, my own experience with the shadow side of criticism concerns writing. I was a journalist for 15 years before tackling PR. Most days, my livelihood, to say nothing of my self-esteem, depended on my ability to crank out large amounts of decent copy on deadline. As a newspaper reporter with daily deadlines you either get over writer’s block or you get out. There’s no time for self-criticism when they’re holding the front page for your story. It was after I left newspapers to become a freelance magazine writer that my self-criticism blossomed. I blame my editors. I learned shortly after starting to freelance that deadlines mean something very different for magazine editors than for newspaper editors. Magazine editors give their freelancers early deadlines, days or weeks before they intend to actually edit the article. They do that to guard against precisely the sort of writer’s block that often crippled me. Yet, ironically, it was because I knew that my deadlines were fake and therefor moveable that my self-criticism could work its evil. With several days to write, no beginning was ever clever enough. Writing is rewriting, as every good writer knows. But when you reach the hundredth rewrite of your lede, you know you’re in trouble. I’m reminded of the story of Rolling Stone Books’ editor Alan Rinzler who, in trying to wrangle the manuscript for Fear and Loathing on the Campaign Trail out of legendary procrastinator Hunter S. Thompson, ended up chasing the godfather of gonzo journalism around a hotel room for 48 hours with a tape recorder in hand. Unable to write, Thompson literally dictated the bestseller. I never reached that point. What saved me, every time, was a deadline. Faced with no alternative but to produce, the words flowed. In the end, I simply lowered my standards and trusted that what came out of my experience and craft would be good enough. Does your inner critic ever keep you from completing work? How do you overcome it?